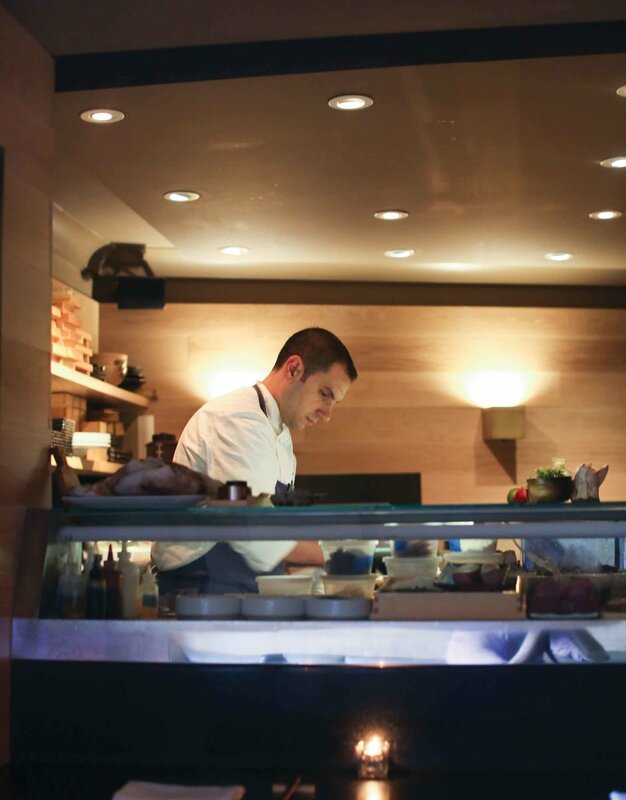 During dinner service at Uni Sashimi, Tony Messina spends the majority of those hours hunched over plates. At times he’ll be dabbing sauces, and another moment a propane torch will be in his grips, lightly searing slices of tuna. After a few minutes, he examines his work and makes a couple tweaks before sending it off to the table. “I’m kind of a perfectionist when it comes to these things.” He laughs as he says this, but he’s not kidding. When you picture a sushi chef, Tony isn’t what immediately comes to mind. Of course, when you go to a French restaurant in the US, you most likely won’t find a Frenchman cooking your food; this is true for all types of cuisine. But when it comes to sushi, it’s a bit jarring to find a 32 year old, Italian-American man from East Boston behind the bar. Most of Tony’s childhood memories are centered around food. Family members gathering together for holidays, cooking up massive feasts. However, it’s the nightly dinners with his family that had the biggest impact on him. There was no doubt in Tony’s mind that he wanted to pursue a career as a chef. To reach the level he wanted, he knew he’d have to start working early. At the age of 14, he got a job as a caterer, working both back and front of house. Tony’s path to his current position at Uni almost seems calculated. Some chefs spend the majority of their careers figuring out where they want to go, with little direction. Tony, on the other hand, was always looking for opportunities that allowed him to grow as a chef. His first big break came with a job as the garde manger at Michael Schlow’s Alta Strada, an Italian restaurant in Wellesley. In addition, he moonlit as a bartender and server there, but his passion for cooking took hold and he worked hard to make his way up to sous chef. Wanting to transition into fine dining, Tony got his resume to Colin Lynch at No. 9 Park. Lynch offered him the opportunity to stage, which ultimately led to a position on the opening team of Menton in Fort Point. While at Menton, Tony heard that Chris Chung, the former chef at Uni, had opened his own restaurant, Aka Bistro in Lincoln. Wanting to make the leap into a new style of cooking, he reached out to see about any available positions. The knowledge passed down by Chef Chung was invaluable, though in order for Tony to reach the level he wanted, he’d need to familiarize himself with all elements of Japanese culture. Western cooking techniques can be quite different from those in Japan, so as Tony transitioned into Japanese cuisine, he had to relearn a variety of culinary skills. After a few years at Aka, Tony heard that Uni’s executive chef position was going to be available, so he asked Chung and Christian Touche, Uni’s General Manager at the time, if he should apply. They both gave their blessing. Each dish on Uni’s menu features ingredients from around the world: spices from North Africa and the Middle East (when I dined there, a green charmoula accompanied his Lubina sashimi), and sauces from South America. Tony’s also found creative ways of giving his dishes a slight Italian spin by accompanying fish with a black truffle vinaigrette or preserved lemon gremolata. Instead of beginning with a particular fish, Tony’s concepts often start with a sauce or a seasonal ingredient he wants to use. At the end of the summer and beginning of fall, dishes included heirloom tomatoes, local herbs, and berries. The type of fish is an important one. Each has its own flavor profile and how it’s handled, from the way in which it’s cut to what it is paired with, varies greatly. 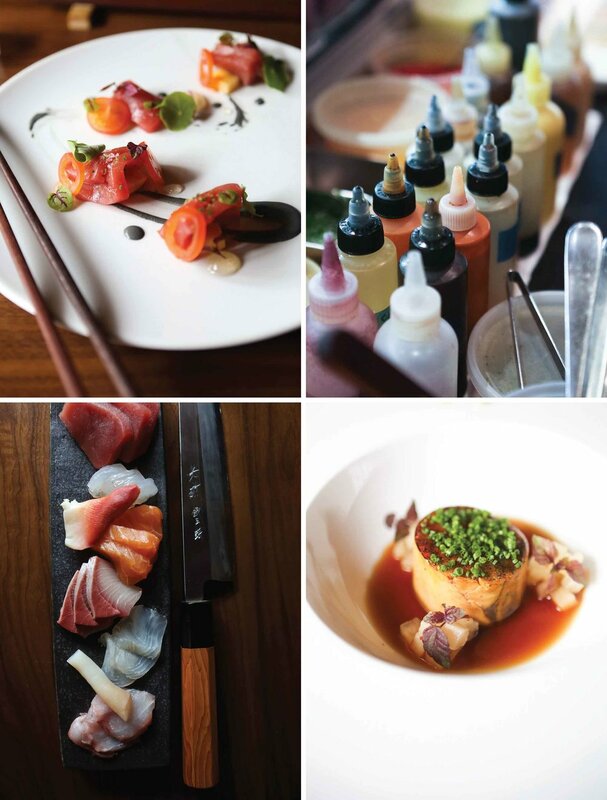 On its own, sashimi is full of lush colors and textures. With Tony’s creations, however, the plate is the canvas and he uses composition to add another layer to the dining experience. Each dish is unique in its presentation, ranging from a more minimalist approach (in many instances, only the rim of the bowl will be used), to something more lavish. Whereas some chefs will sketch a drawing of how these will be composed, Uni’s plating tends to come together at the last minute. When conceptualizing a dish, Tony will have a general understanding of how it will look, but he says a lot of the plating is mood-based. Watching Tony work, it’s clear that he’s in his element at Uni, where the sky’s the limit as to what he can create. There will certainly be more obstacles, especially in these first years as sashimi chef, but this is something he enjoys about cooking.